Some afternoons call for an easy summer dress and feminine details. I'm often inspired by my surroundings and lately our yard has been full of fresh blooms. So I decided to dress to match. This dress is prefect for so many occasions and I love that it's from Forever 21. I couldn't find the exact one online but I found a few similar styles here, here, and here. Such a fun and cute dress. I can't believe it's from Forever21 - crazy. That's such a pretty and feminine outfit!! Such a fresh and lively dress! I looveeee the halter shape on you. I haven't been wearing my bright pink lipstick lately (due to sheer laziness), but your look has absolutely inspired me to pick up my game! such a pretty dress, and works so well with your accessories! please, stopped at my latest post:)i'll happy! Dress is absolutely beautiful and perfect for summer. Pretty outfit! this hat is perfect! ♥ your outfit. and the dress is just perfect! i really love this outfit! everything is perfect! sooo pretty and sooo 60's with the balloon skirt! i love the floppy hat too! That dress is darling and so summer perfect, too! I'm jealous of all the sunshine you're having that's allowing you to wear such a lovely outfit:) I'm dealing with actual autumn/winter weather and it's July?! stunning dress..you look amazing hun! and your clutch is gorgeous!! And a smile to go with! Ur pictures are always so sunny and warm, I just love it! Beautiful pictures! That background is your yard?! It looks amazing! Love the dress and clutch! So feminine and pretty! the perfect outfit for a pretty, summer day! You are so beautiful! I adore the colors and the femininity. Great look, Taylor! You look oh so lovely and your gams are phenom! :) All your hard work pays off because your bod looks great! Inspires me to get back to working out!! Always surprised when F21 actually makes something that looks nice. You have to weed through, but you can find some nice things there. So delicate and feminine! Love the jeweled turc accents. I love the dress! Forever 21, how'd I miss it? Did you get it in store or online? It's gorgeous, love this entire look! I love the outfit! The dress is amazing! Beautiful! You look like the perfect picture of summer, the hat and sandals are awesome, but I died for the clutch, so pretty! Loving this dress with the blue watch! I am obsessed with that dress, love the colors! Looks like a perfect wedding outfit. So pretty! I love the floral print!! SO pretty and that first pic is amazing! Loving the new layout with the bigger photos! 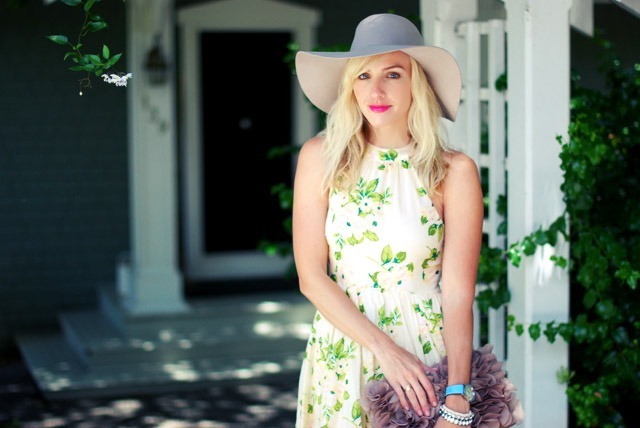 This dress is just darling, you look so sweet & summery! I can hardly believe that dress is from F21! It looks like a Modcloth or even Topshop piece. I'm also crushing on your Tokyo watch. that clutch is amazing, i really love the whole outfit! What a gorgeous dress! I love the shape and the print is so pretty. so summery and fun! love that watch. perfect outfit for a summer garden party! the hat is super cute. 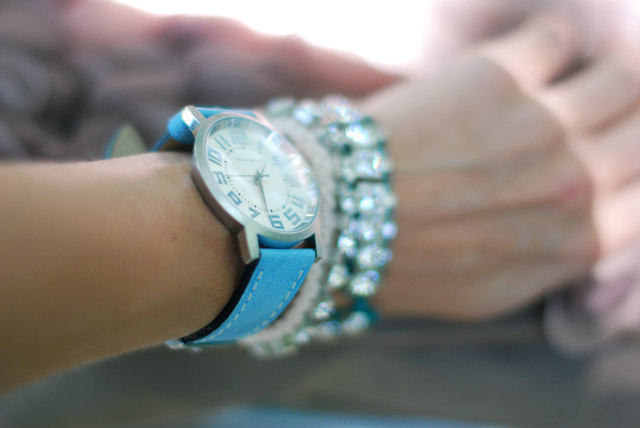 I love the blue watch and bracelet combination. Beautiful! I love the floral dress with the "blossoming" clutch! the pattern on the dress is so fresh and light..i love it! Very cute look! What a lovely little frock! I can't believe this dress is from F21. What a great find! I love the pattern of your dress, especially with the flowers surrounding you! It just looks so peaceful/ beautiful. The hat is the icing on the cake! Such a pretty outfit!! I am in love with your clutch! I love love LOVE everything about this outfit! !